Wanda Schuttenbeld doesn’t want to ever put her cows through the ordeal of flooding again. Severe flooding this spring was the last straw for Schuttenbeld family in Maugerville, N.B. New Brunswick dairy operator Wanda Schuttenbeld doesn't want to ever put her cows through the ordeal of a flood again. She said the 2018 flood in New Brunswick was the worst they've ever seen. In order to keep her family's Holsteins safe, they've decided to move the herd five kilometres away to drier ground. "It was terrible, it was gut wrenching," Schuttenbeld said. When the water levels rose early in May, Schuttenbeld moved her cows to Sussex with the help of friends. Soon after, the area they left was underwater. Now the Schuttenbelds are preparing to permanently move their cows five kilometres across the river to keep them out of harm's way. "We have to go close enough that we can still farm our land but have our cows on the other side of the river where it is safe and then haul our feed there," said Schuttenbeld. "It's our only option ...if we had to buy a whole facility of land and put a barn on it, it's just not affordable. It's a payment you'd never be able to make." But the plan is being opposed by some people who live next to the land and the Schuttenbeld's request is going through the area's Land Registry Committee. Schuttenbeld says there was little warning about the rapidly rising flood levels. 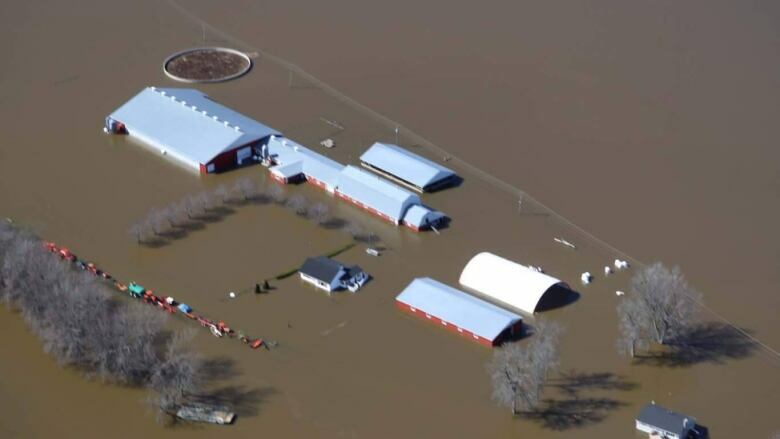 The Oromocto Fire Department had told her the farm would be fine, and the water would reach around 2005 and 2008 levels. "We felt ... we're comfortable with that. It's not in the barn, you know, we'll sit it out," Schuttenbeld said. "But as I drove to Oromocto, the water was rushing so quickly across the road and down, there was something desperately wrong ... so I rushed back home." The family knew they had to move cows and equipment, but weren't sure where they would be able to go. "In 2008, we were rescued, and we swore we would never ever put any people through that again. It was very dangerous," Schuttenbeld said. They left and went toward Sussex where they were able to borrow a barn to house their cows. "At no time, did we get any warning from anybody that it was going to be a bad flood." There are two groups of heroes in Schuttenbeld's mind — her cows and the community that helped during the flood. "I would have never thought I could've survived something like that but people were so kind and good to us that you just rise to challenge and get through," the woman said. Schuttenbeld says the cows showed incredible perseverance during the flood. "They are really the famous ones in this whole journey. They survived this and they still work hard everyday, to make us money to pay the bills," she said. "Somehow, we have to get them to a safe place. We can't imagine our life without them."